Baby Lara was born weighing 3.8kg, a perfect miracle considering the family decided to bring her birth forward so Emile could meet her. This article first appeared in the June/July 2016 issue of Your Pregnancy. When in December 2014 Aldi and Emile Fabricius from Worcester found out they were pregnant with their second child they were over the moon. Their firstborn son, Dyllan, was nearly five years old and after an ectopic pregnancy earlier that year, they knew their chances for another baby were slim. Earlier the previous year, Emile, then 38, was diagnosed with oesophagus and gastric cancer. Chemotherapy treatment seemed to be unsuccessful and in June 2013 Emile underwent a seven-hour surgery to remove the cancer. Healing was slow and painful, but in February 2015, a couple of weeks after the wonderful news of their pregnancy, Emile was given a clean bill of health. He was in remission. 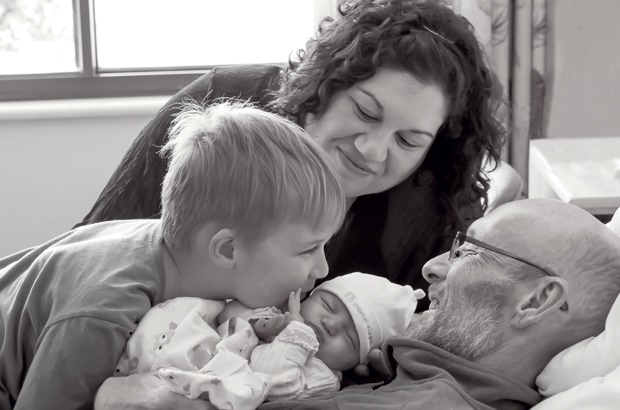 Three months later, the euphoria of expecting a baby and the promise of health was abruptly interrupted when Emile suddenly started having spasms and reflux. More tests were done. Aldi was 34 weeks pregnant when Emile was admitted to hospital again with a tear in his oesophagus from severe spasms. The tear caused fluids to leak onto one of his lungs and he was transferred to Mediclinic Panorama in Cape Town for treatment. At this time Emile was not able to eat and had to be fed through a feeding tube. He lost 10kg in two weeks. The cancer was back. A regrowth was found where his stomach used to be and it had also spread to his pancreas. Aldi visited Emile every day. 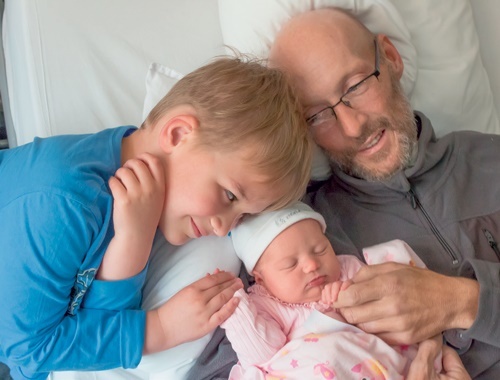 When he saw her he would wistfully lay his hands on her growing bump, urging the doctors to hurry with his treatment so he could be there for the birth of his baby girl, Lara. At 38 weeks, Aldi’s amniotic fluid was decreasing, and she realised they were running out of time. She didn’t want Emile to miss the birth of his daughter and consulted with her own and Emile’s medical teams. It was decided that Lara would be born via C-section so that Emile could be there for her birth. Lara was born on 4 August 2015, weighing 3.8kg – a perfect miracle. Sr Mirinda Coertzen and her team arranged for Emile to be in theatre to watch his baby girl’s birth. Arrangements were also made to provide the family with their own room in the labour ward so that Emile could continue his treatment next to Aldi as she recovered from her C-section and bonded with their baby girl. Mediclinic Panorama and Alda Smith from Love Alda Birth Photography & Mentoring collaborated on giving the family a beautiful newborn and family shoot in hospital shortly after Lara’s birth. Aldi and Lara were discharged, and Emile followed two days later. There was little that the doctors could do to heal the lymph leak and chemotherapy had to be postponed. Lara was a “daddy’s girl” right from the start. Whenever she was fussy, Aldi would simply lay her in her father’s arms where she would happily settle. Aldi got into a routine of caring for their son Dyllan and baby Lara, while feeding and cleaning Emile every three hours. It was difficult. Lara was lactose intolerant with colic and silent reflux. Every night between 12am and 2am Aldi would sit with her to try and rock her to sleep. She would always eventually fall asleep in her daddy’s arms. Luckily, Aldi’s mother was with the family from the beginning, helping along the way. Even though Emile was in a lot of pain and on schedule-six medication, he would insist on feeding Lara in the evenings and appear with a bottle of milk just as Lara became niggly for her dinner. One night as Lara rested in his arms, Aldi heard him apologise to Lara for not helping out as much as he wanted to and for not being able to do everything that he so desired to do for her and her brother. Three weeks after Lara’s birth, following a brief period of weight gain and what seemed to be the first glimpse of recovery, Emile was re-admitted to hospital with unbearable pain. Aldi saw him on the Wednesday and promised that she would bring the kids on the Friday. When Aldi entered the room on the Friday, she found Emile with an oxygen mask on his face. A teary-eyed nurse confirmed her worst nightmare – Emile had passed away. They had been trying to get hold of Aldi. Aldi managed to apprehend her father who was following shortly behind her with Dyllan. She couldn’t find the words and her father explained to her son what had happened to Emile. Dyllan asked to see his father and Aldi let him say goodbye. He sobbed for what seemed like forever on his grandmother’s lap. For Aldi and her family, the hurt is still unbearable and real, but alongside it lives the memory of Emile and the lifeline of compassion his love continues to inspire in others. We thank her for sharing her family's beautiful story with us and wish her and her beautiful children all the best.